The Promask Combi - continuous flow compressed airline system is designed to meet the requirements of EN 14594 "Respiratory protective devices. Continuous flow compressed airline breathing apparatus. Requirements, testing, marking." 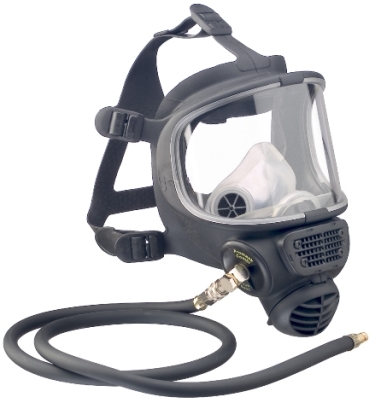 The Promask Combi incorporates a positive pressure full face mask in accordance with EN 136; featuring a faceblank with wide T-profile sealing edge, transparent silicone inner mask, panoramic visor; fully adjustable 5-point natural rubber (NR) head harness with quick-release plastic buckles; right side bayonet connector for compressed air supply; a breathing hose; left side 40mm thread connector (to EN 148-1) for a filter connection including an inhalation valve. The faceblank is made from a specially engineered halo-butyl compound. The Promask Combi is available in two sizes: M general size and S small size. The visor is available in 2 material choices: polycarbonate and polycarbonate HC = hard-coated, for scratch resistance. Promask Combi includes a special adapter for connection to a compressed air supply and a breathing hose. The system needs to include the Scott Airline FCV regulator and be connected via a compressed-air hose to the source of compressed air. The Promask Combi CA full face mask is fitted with a self-closing connector. When entering and leaving the contaminated area, the connector can be detached from the FCV valve and the left side connector fitted with a suitable 40 mm thread standard filter (Pro2000). The continuous flow compressed airline full face mask is designed to operate with breathable quality air from an industrial compressed air network or a compressor. Air is delivered to the face piece via the breathing hose.